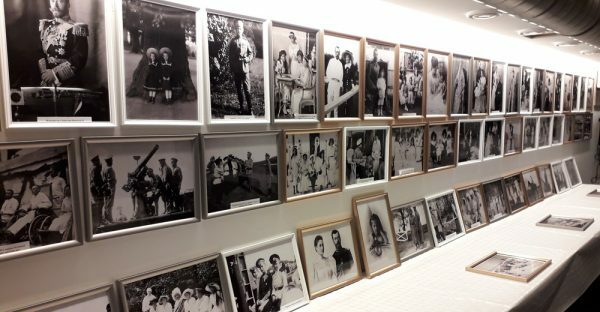 A photography exhibition, “The Romanovs: Royal Service” opened recently in the Serbian Orthodox Holy Trinity Church in Zurich, initiated by the Serbian Orthodox Diocese of Austria and Switzerland with support from Moscow’s Sretensky Monastery, reports Pravoslavie.ru. The opening ceremony was held on November 30, preceded by an Akathist to the Icon of the Theotokos “Of the Three Hands.” Fr. Branimir Petkovic and Hieromonk Ignaty (Shestakov)of Sretensky Monastery spoke about the presented photos and the heroism of the Royal Family. Tsar Nicholas II is widely venerated in Serbia, and the exhibition worthily demonstrates its love for him. It aroused considerable interest among the church’s youngest parishioners. Additionally, a meeting dedicated to the Royal Martyrs and Russian-Serbian relations was arranged in the parish house after the Divine Liturgy on December 2. The photos speak of the life of the last Russian Emperor and the family relations, sacrifice, and service to the Church and homeland of all the members of the Romanov family. The exhibition is dedicated to the centenary of the killing of the Royal Family. Similar exhibitions were earlier organized in various cities of Russia, and in Dortmund, Buenos Aires, Johannesburg, and Auckland.